Dr. Andrew Jackson, F.A.C.S.M., Professor, Department of Health and Human Performance, University of Houston, Texas, developed the PWC/FC system. The Physical Work Capacity (PWC) and Functional Capacity (FC) Evaluation System evaluates an individual's capacity to perform physically demanding work tasks. Pre-employment: The PWC report evaluates a job applicant's capacity to perform physically demanding work tasks. Return to work (RTW): The FC report not only evaluates an employee's capacity to perform physically demanding tasks at a level that allows for the safe return to work, but also evaluates the employee's general physical fitness. Development of the PWC/FC system is founded on over 20 years of ergonomic research at the University of Houston, involving the validation of pre-employment tests and the defining of physiologically justified standards or "cut scores." 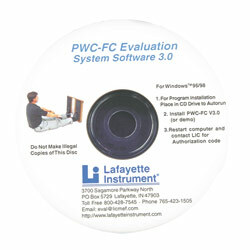 The PWC/FC Evaluation System uses isometric strength tests to define work capacity on a wide group of common, physically demanding industrial work tasks. The ergonomic principle is to match the worker to the demands of the job. Validation research is the linkage between test results and job tasks, making the system congruent with federal legislation, such as the Americans with Disabilities Act and the EEOC Uniform Guidelines. The work families provide a model for categorizing physically demanding industrial work tasks. The physical capacity tests include isometric and fitness tests. The isometric tests provide a valid means for evaluating capacity to do the work tasks defined by the three general work families. The physical capacity test and demographic data are used to generate a report that evaluates an individuals PWC or FC. Equations developed from pre-employment, exercise physiology and ergonomic research are used to generate the individuals PWC or FC report. Implementation of the PWC/FC Evaluation System assumes that the physically demanding job tasks are well defined and that the job tasks can be categorized within the general work families previously described. In addition, job descriptions must be up to date. These five tests have been found to measure the strength of the major muscle groups used to perform physically demanding work. The primary instrumentation used to perform a PWC Evaluation is the Jackson Strength Evaluation System (JSES). Developed by Dr. Andrew Jackson, the JSES was used in the development of validation research at the University of Houston during the last 20 years. In addition, the JSES has been adopted by companies in the telecommunications, small package carrier, transportation, manufacturing, construction, petrochemical and medical industries as the instrumentation of choice to perform physical ability testing.